Labour – which looks set to become the biggest party in Dublin, and is likely to win over 30 seats nationwide. Eamon Gilmore – who’s likely to top the poll in Dun Laoghaire, while his running mate Ivana Bacik will be in a fight for the last seat. 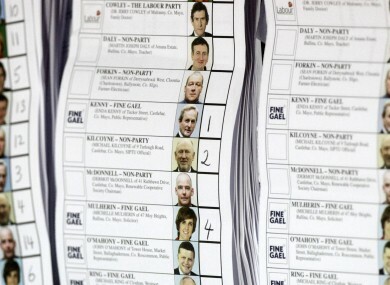 Fine Gael – which is likely to win at least 71 or 72 seats nationally, pundits predict – not an overall majority but still an excellent result for the party, says director of elections Phil Hogan. Paschal Donohoe of Fine Gael is likely to top the poll in Dublin Central, making him the first Fine Gael TD in Bertie Ahern’s old stomping ground since 1997. Charlie Flanagan is likely to top the poll in Laois-Offaly. Mick Wallace – the Independent is going to top the poll in Wexford and will exceed the quota, with over 13,645 first preferences, if tallies are correct. Shane Ross – who looks likely to top the poll in Dublin South. Micheál Martin – his party may be in a meltdown nationally, but the Fianna Fáil leader is topping the poll on 16.7 per cent, and is likely to bring in his running mate in Cork South Central, Michael McGrath. Sinn Fein – which could win 13 or 14 seats nationally. Gerry Adams looks set to top the poll in Louth, while Pearse Doherty looks set to repeat the by-election success. Fianna Fáil – several senior Fianna Fáil ministers are struggling to hold onto their seats: Mary Coughlan, Mary Hanafin, Barry Andrews and Sean Haughey are among those who are in trouble, as the party is virtually wiped out in Dublin. Nationally, the party’s likely to hold onto just 20 seats. Conor Lenihan - the finance minister’s brother has just conceded defeat in Dublin South West. The Greens – who are facing an electoral meltdown. Frank McBrearty – who has conceded defeat in Donegal South West. Twitter users – Unfortunately, no-one seems to have told the social networking site beloved of politics junkies that this was supposed to be the Twitter election. Email “The Half-Past Fix: 2:30pm”. Feedback on “The Half-Past Fix: 2:30pm”.